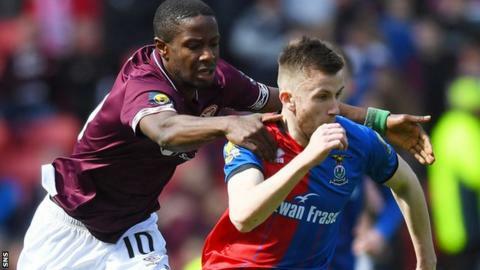 Motherwell have agreed a deal to sign Inverness Caledonian Thistle midfielder Liam Polworth on a pre-contract. The 24-year-old will join on a two-year contract in June, joining Livingston defender Declan Gallagher in signing for the Fir Park club for next term. Manager Steven Robinson hailed the signing of the man with the joint most assists in the Championship this term. "He is a very talented boy and I still feel there are a lot of areas he will improve on with us," he said. "We hope he will continue his creativity and he will give us another option in the middle of the park and out wide." Having been with Inverness CT since the age of eight, Polworth became the club's youngest ever player when he made his debut aged 16 years and 211 days in May 2011. He has since scored 19 times in 204 appearances for the Highlanders. The former Scotland Under-21 international has three goals and 20 assists to his name so far this season in all competitions. "We would like to take this opportunity to thank Liam for the contribution he has made to the club so far and look forward to him helping the team to a strong end to the season," Inverness CT said.